The Brandon Artists Guild is honored to exhibit the artwork of Liza Myers, one of the original founders of the cooperative gallery. Beginning with an opening reception on September 7th (5 to 7 PM), the show “Nesting Instincts” will be on view through October 31st. The acrylic paintings by Myers depict visionary images gleaned from her extensive knowledge of the natural world — birds and their nesting habits and other creatures of the wild. In her newest art she shows petroglyphs, pairing the ancient symbols, incised into stone, with the modern creatures they represent. 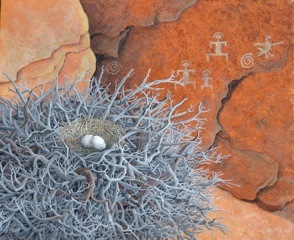 In the painting “Golden”– the exotic nest and eggs of a Golden Eagle — we see petroglyphs on a rock in the background that include a symbol for eagle. Myers has lived in Mexico, on the jungle coast on Nicaragua, in the Andean highlands of Colombia, on the llanos of Uruguay, and in the orchid-filled forests of Paraguay. This past winter and spring she was in Taos with a Wurlitzer Foundation Residency and a support grant from Castleton State College, allowing her deeper exploration of her life’s work, traveling in the Western and Southwestern landscapes that she loves. The public is welcome to come meet the artist at the September 7th opening reception for “Nesting Instincts.” The gallery at 7 Center Street in downtown Brandon is open daily from 10 AM to 5 PM.